Published October 3, 2010 By Anna T. This post may contain affiliate links. Regardless, I only recommend sites I've researched and/or used and trust. Working for Accolade Support is essentially working for a virtual call center. You do all the things you would normally do at any call center: take customer complaints, give tech support, try to sell things to inbound callers, sell things to outbound callers (telemarketing), but you do it all from home. If you have experience in customer service and can provide a quiet background (at least during certain hours of the day), this may be the job for you. Here are some basics on how the job works and details on pay, etc. Pay: $7.25 to $10.00 per hour. Their website now says you are paid hourly base compensation plus. To work for Accolade Support, you must have high speed internet and you cannot use a wireless connection. Also, your telephone has to be corded with a headset — no internet phone or cell phone, just a land line. Accolade wants to hire people with good customer service skills, so it's important to add that to your resume if it's something you've done before. If Accolade Support follows up on your emailed resume, they will probably want you to do some training and take a little test. They will provide the training materials. You will also have to do a voice audition so they can see if you have a professional tone suited for the job. A phone interview might also be required. The pay is a little on the low side when compared to some other work at home opportunities, but when you figure that you're doing it from home it doesn't seem so bad. You can eliminate the price of gas and other work-related expenses from what you make. One big downside to this job and others like it are the fact that you have to be able to guarantee no background noise while you work. This is impossible for most parents, who also happen to make up a large portion of the people looking for work from home. When you have kids, especially young kids, you just can't guarantee no noise. If they're asleep, they might wake up screaming. You just never know! That's the main reason why I have always shied away from virtual call center jobs, even though I do have some customer service experience. But, I think you could make it work, kids or no kids. You could just take your chances and work while they are sleeping, or get someone to watch them while you work. Parents of school-age children should be able to work while their kids are at school. There are lots of parents who work for these types of companies and get by OK.
We have some tips on working at home with kids around if you need some ideas on how to make this work for you. Accolade Support only wants part-time workers, and if you are hired they will ask you what hours and days you are available to work. During these times, you need to be at the ready for calls. The call volumes will vary depending on how busy they are, but you are still compensated hourly. When you work for this company, you sign up to be an Independent Contractor which means you are responsible for your own tax stuff — they don't take taxes out on you, but they will send you a 1099 at the end of the year so you can settle up with Uncle Sam. If you'd like to apply at Accolade Support, go here to fill out their online application. Note that like most companies, they may not always have openings. 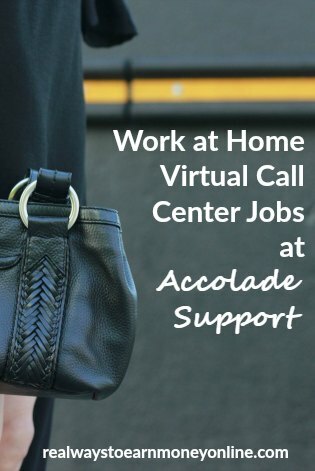 If you don't think Accolade is for you or you find that they are not hiring right now, you can check out this list of over 100 work at home phone jobs. You may find something else there that will work out for you. Here are a few things to consider doing (or do all 3!). I attempted to apply for this through the email they provide on their page. The email was returned. Would you have any suggestions on a job that offers evening or late night part time hours? Thanks. Hi Stephanie, you might consider Convergys: http://realwaystoearnmoneyonline.com/2011/07/call-centers-at-home.html If I’m not mistaken, they have both part and full time positions and also may offer flexible scheduling (evening hours). I can’t confirm that they have that available right now, but you may want to look into it. hr-ts@tier3support.com is the correct email address.